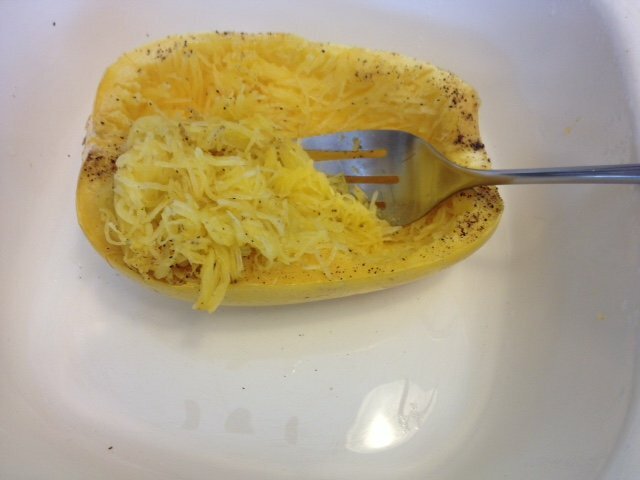 My wife and I love to experiment with food – Paleo-type food of course. We came across a recipe for clams and bacon sauce over spaghetti – certainly a no-no for Paleo aficionados. So, we doctored it to make it Paleo. The result was fantastic: clams & bacon over spaghetti squash. In my opinion, we created a winner. 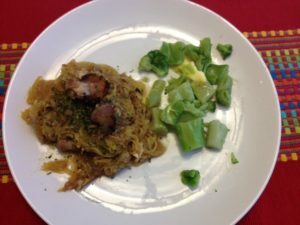 We substituted the spaghetti with spaghetti squash, and we changed the ingredients in the sauce to make it completely Paleo. The bacon is from pastured pork, and the canned chopped clams are from Bar Harbor that have no additives. 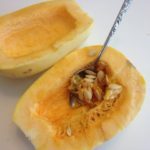 The recipe has three parts: (1) cut, cook, and shred the squash; (2) prepare the clam & bacon sauce, and (3) plate and enjoy. 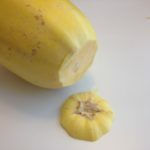 Here are the directions to cut the raw spaghetti squash in half lengthwise. You need a paring knife and a sharp, sturdy chef’s knife. 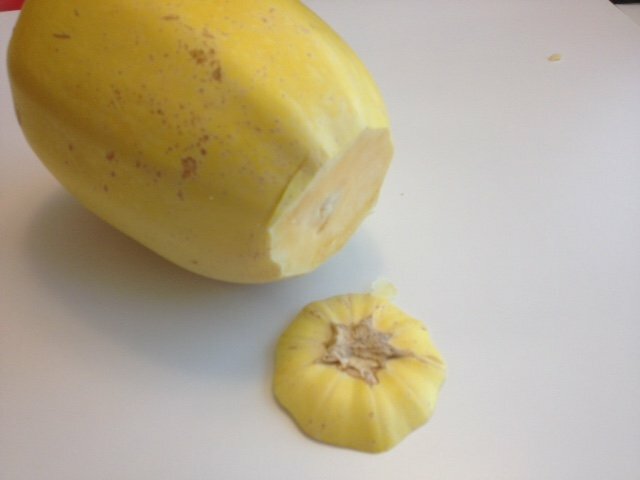 The outer shell is hard, and the squash rolls around easily! Cut the stem off with a sharp knife. Cut a groove in the surface about 1/2 inch deep from end to end lengthwise on one side using a paring knife. Hold one end of the squash with one hand. 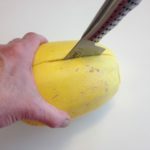 With your other hand place your heavy-duty chef’s knife in the middle of the squash in the groove with the blade facing AWAY from the hand holding the squash. Press straight down with your chef’s knife until the tip of the blade meets the other side. Then, pull the knife down (away from your hand that is holding the other end) along the groove, cutting one side in half. 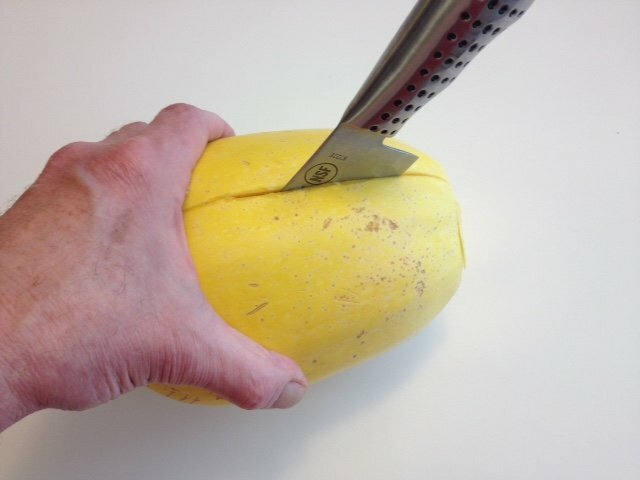 Repeat the process to cut through the other half of the squash with the blade facing AWAY from the hand holding the squash on the opposite end. 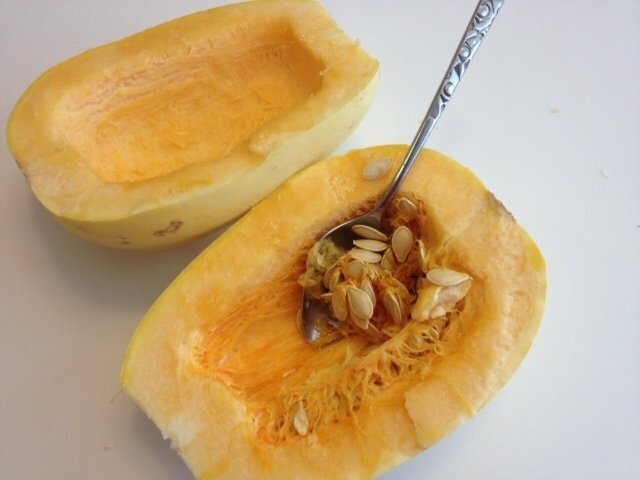 Separate the halves and scoop the seeds out with a spoon or fork; discard the seeds. Place each half (shell side down) in a casserole dish and brush ghee or butter on each surface. Sprinkle salt and pepper. Cover the casserole dish and cook in the microwave for 5 minutes on high. 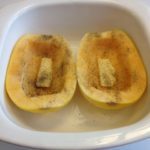 Check with a fork to see if the flesh of the squash is soft. If not, place in the microwave covered for an additional 2 minutes and check again. Repeat until the flesh is soft. Let cool covered for about 15 minutes. 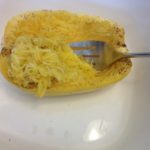 After it has cooled so you can handle it, use a fork to gently scrape the flesh of the squash, shredding it into strands that actually look like spaghetti. Set aside “spaghetti” in a covered dish. Heat a large skillet over medium-high heat. Add bacon and cook until crisp, about 10 minutes. Transfer the cooked bacon to a plate, leaving the fat in the skillet. Reduce the heat to the skillet to low. Add onion, garlic, salt, black pepper, and red pepper flakes to the bacon fat. Cook and stir until onions are softened, about 4 -5 minutes. Add white wine, and raise the temperature to medium high. Stir well. Simmer for 5 minutes. Add juice from clams, and simmer to thicken (about 15-20 minutes). Add chopped clams and stir. Cook until heated through, but do not overcook or the clams will become rubbery (about 1-2 minutes). Add the spaghetti squash and bacon to the skillet and mix thoroughly with sauce. 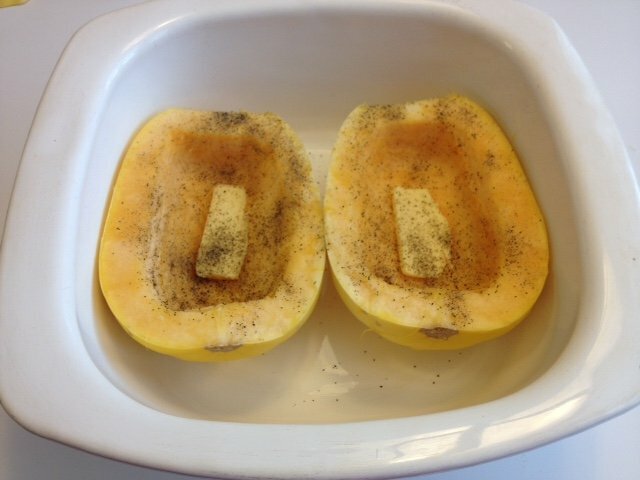 Place the squash mixture into individual bowls.